With Rob away playing darts, organising this weeks match fell to me, towards the end of the week, the temperature dropped and we even had some brief flurries of snow! 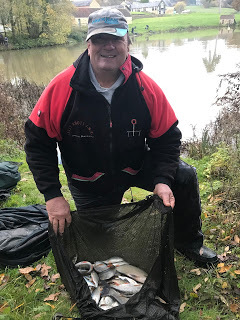 There was also a lot of rain forecast for the weekend but with landlord Steve off chucking arrows as well, we were meeting down the river, so would be able to see if it was fishable and if not we could still head out the pond. I actually popped down the river on Saturday afternoon to have a look at Lower Coxes as pleasure anglers have been reporting some good catches and I have to say I really fancied pegs 27, 28 and 29 and would try them on Sunday if we were on the river. 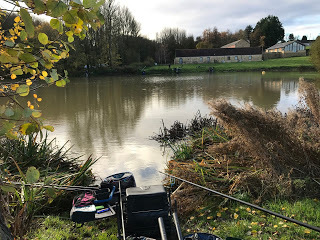 There were also several cracking looking swims between the copse and the old peg 36 (Green Hut) and then peg 37 looked amazing, there was also one above it that looked like it should hold a lot of fish too. The trouble is they’re a bit of a trek, especially with all the kit we take with us these days. With some rain forecast we could be in for a really good match but of course by the evening we had thunderstorms and torrential rain which put paid to any chance of it being on the river. Paul Homewood had booked in for this one and as he wasn’t sure where we were doing the draw, we arranged to meet at the Spar in Ilminster which also gave me chance to get a bacon butty. We soon arrived at Upper Coxes and with the river a raging torrent, we waited for the others to arrive before heading to the pond. There were no pleasure anglers out there so we had our pick of the pegs, with all the balls in the bucket, I asked Paul to pull out a golden peg and 17 was the result, Baz Morgan had phoned earlier and was on his way and asked if someone could draw for him, Paul dipped his hand in the bucket again and put Baz on 20. I then asked Steve P to draw for me and he only managed to pull out peg 6 on the far bank, not my favourite area, but then I did put it in so perhaps it served me right! The pond was chocolate coloured and as I took my kit round the pond, it was a little worrying that I hadn’t seen any fish move and I said to Fieldy on peg 4 that it would either fish it’s head off or be rock hard but then as I started to set my kit up, I saw a couple of small fish top which made me feel a little better. 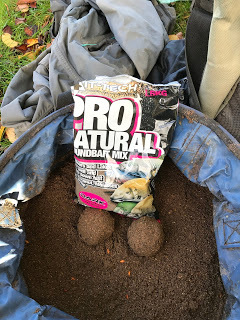 I mixed up some Bait-Tech Pro Natural Dark and left it while I set my rigs up, a 0.5 gram Drennan Roach (I still can’t believe they’ve stopped making them!) for on the deck at 10 metres and a little Preston Chianti for up in the water. Both rigs had size 18 barbless Kamasan B611’s to 0.10mm. On the side tray I had maggots, casters and Bait-Tech Super Seed Hemp. Baz had arrived but would be pushed to get ready in time so I put the start back 15 mins. It was a lovely day and although it was a little chilly, I couldn’t believe how lucky we’d been considering how awful the weather was last night with more to come later on today, hopefully we’d just about avoid it. I shouted the all in and Baz was just about ready, I cupped in two balls of Pro Nat Dark at 10 metres and shipped out with single red maggot on the hook with the main aim just to get a bite at this stage. The float settled and it wasn’t long before it slid away and I was off the mark with a tiny roach, a few more followed and it was a bite a chuck. I could see Fieldy had started on the short pole to hand but with no bites he was soon going out on the long pole. I put two reds on in a bid to improve the stamp and it worked to certain extent with a few 2-3oz roach but I was still getting too many tiny fish for my liking. I tried caster but knew it was too early for it and I waited ages for a bite with the result a fish no bigger than the ones I was getting on maggot. I would keep feeding casters and hemp and trying a caster on the hook every now and again but normally they don’t switch on to it until later at this time of year. 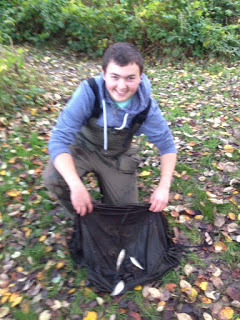 I was getting the odd 3-4oz rudd and roach and had one cracking redfin around the 8oz mark. 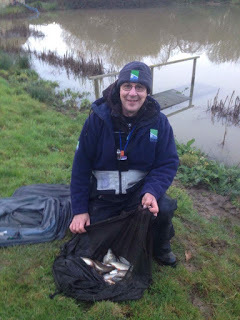 After an hour I had 26 roach, rudd and some chunky little perch which I was fairly pleased with, I was ahead of Fieldy at this early stage and it looked like the anglers on the far bank were struggling, Adie Bishop on 18 had landed a skimmer on the feeder but it didn’t look like much else was happening. The second hour was similar and I added another 23 fish although the average stamp was on the small size and dropping off a 3oz fish hadn’t helped! 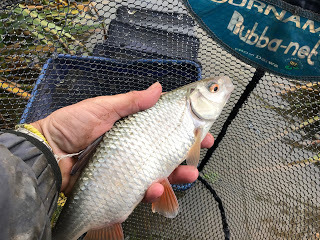 I felt I needed to do something to try and catch bigger roach so cupped in another ball of groundbait and while that settled, I tried the shallow rig which was a waste of time and I never had a bite on it. 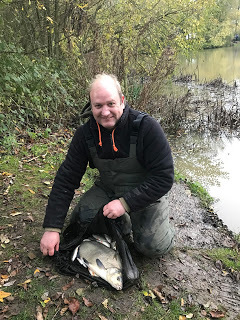 I carried on catching during the third hour but my catch rate was still going in the wrong direction and to make matters worse Justin on peg 13 had landed a lump, I’d also seen Paul H on 14 land a couple of skimmers and the anglers opposite were now catching regularly as well. With just over two hours to go the clicker was reading 70 and I was still hopeful I’d get a good run of caster fish to boost my weight. 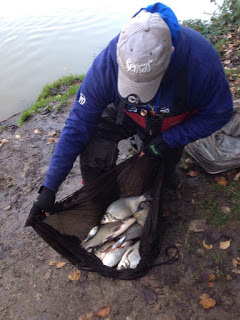 With ninety minutes left I was getting the odd better fish on caster but they weren’t queuing up, Fieldy was getting a fish a bung now but I still thought I was doing okay although I did lose a good roach shipping back. Then with three quarters of an hour to go and the light fading, I finally started to catch well on caster including a couple of clonking roach and I was having to use the landing net more often. I reached 130 fish and a quick check of the watch showed time was up so I shouted to everyone and started packing up. 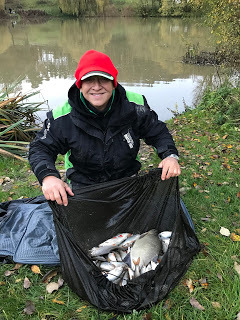 Fieldy asked how many I’d ended up with and I told him, he said I’d beaten him as he’d had 102 fish but only one bonus in the shape of a 12oz skimmer but I wasn’t counting any chickens as his estimates are normally so far out, it’s criminal (yes even worse than me!). 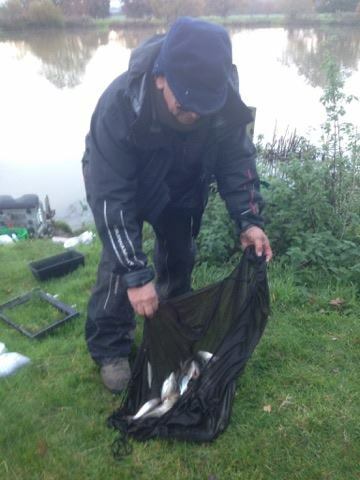 He reckoned on having about 7lb if the fish averaged an ounce apiece and adding on his skimmer. I thought I might possibly have 10lb (128 fish at an ounce would give me around 8lb plus I thought those bigger roach would give me another 2lb or so). I had the scales so walked down to weigh Paul in first, he had three skimmers plus some roach and when the needle stopped just past the 10lb mark, all of a sudden I wasn’t so sure I’d done as well as I first thought. 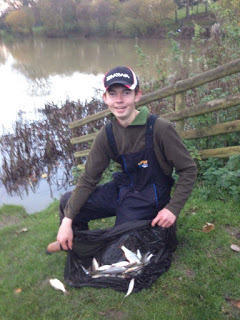 Justin’s lump turned out to be a decent bream which boosted his weight to 8lb 12oz. Then it was my turn and my fish went 10lb 5oz which put me in the lead, Fieldy was next and as soon as he pulled his net out I knew he’d done me, for a start his 12oz skimmer was nearer 2lb!!! !, I called his weight at 12lb 7oz and my lead was short lived. Steve P was admitting to 4lb and weighed exactly that! 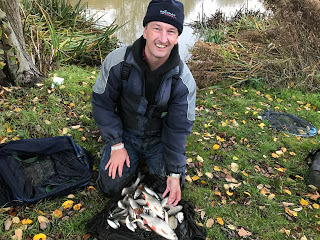 I ended up third and picked up £20 plus a nugget off Steve, so another really close match and I do enjoy fishing the pond in the winter, loads of bites and I’d probably missed/bumped enough to have pushed Fieldy but so had others, great fishing. Nice haul, looks to be a fun day.